You are here: Home / Healthy Living / 4 Skin Moisturizers You Can Eat! I work part-time at a health clinic. That means I wash my hands A LOT! Frequent hand washing and using antibacterial gel wreak havoc on my hands, sometimes even leading to cracked skin. This has led me on an eternal search for the perfect hand moisturizer! 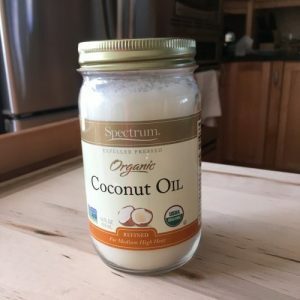 Unless you’ve been living in the mountains of Tibet, you’ve probably heard the virtues of coconut oil. 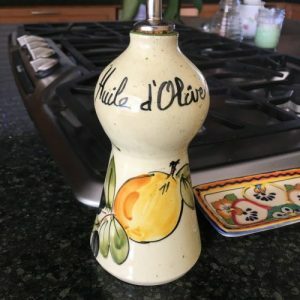 Extra Virgin Olive Oil (EVOO) is my go-to cooking oil and I keep a cute little bottle next to the stove that helps me pour just the right amount into the pan. It’s also super convenient to put a few drops on my hands to moisturize. The trick to using oil on your hands is you can only use a drop or two unless you’re not going to be doing much afterwards. So I like to use it after I clean up and before watching the latest episode of International House Hunters. The olive oil soaks right in to your dry skin. 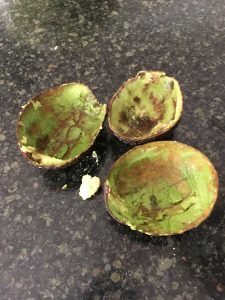 Eating avocado is also great for your skin–it contains antioxidants vitamin E, vitamin C and carotenoids, which protect your skin from environmental damage that leads to fine lines and wrinkles. Avocado is also full of monounsaturated fat–a skin-boosting fatty acid. 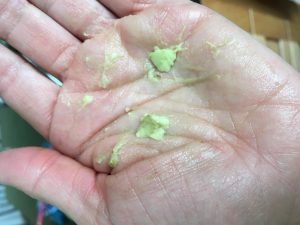 So, last night, I probably got a my week’s worth of skin-nurturing nutrients in my guac! The next edible moisturizer I found (yesterday as a matter of fact!) 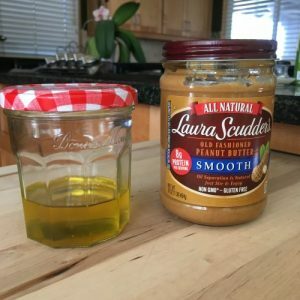 appeared as I was draining off a bit of peanut oil from my favorite natural peanut butter, Laura Scudder’s. 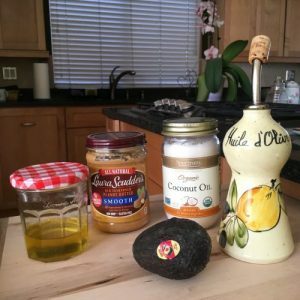 (It’s a hack I use to make natural peanut butter the perfect consistency. I then use the peanut oil for cooking–or now, moisturizing!) Well of course, you know what happens when you pour oil from a jar–it drips down the side and gets all over your hands. But wait–don’t rinse it off-rub it in! That’s what I did and Eureka! I discovered that peanut oil makes your hands feel so smooth. It soaks right in, too. So there you have it. 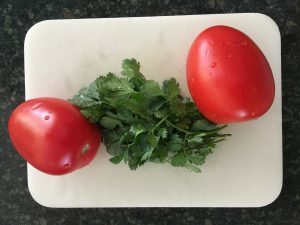 Multi-purpose kitchen ingredients you can use to save cleanup and multi-task with your favorite kitchen ingredients. 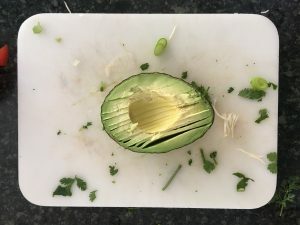 For more great avocado info and recipes, check this out! For nut recipes: 12 Healthy Nut Recipes You Can’t Resist!